New York Gov. 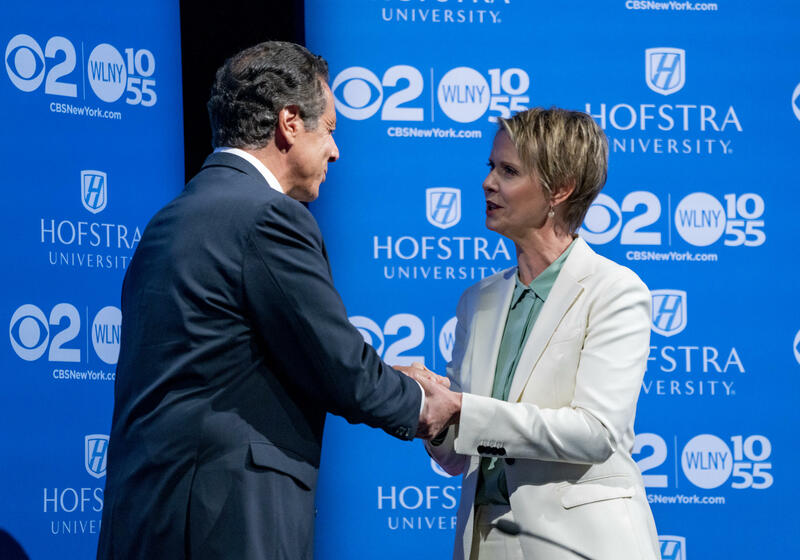 Andrew Cuomo is facing an unexpectedly serious primary challenge from Cynthia Nixon, an activist and actress who, if elected, would become the first state executive to have won Emmy, Grammy and Tony Awards. Cuomo, the son of famed former New York governor and almost presidential candidate Mario Cuomo, is seeking his third term. Nixon has tapped into a vein of progressivism that helped Alexandria Ocasio-Cortez win her primary against Rep. Joe Crowley in June. She is also trying to capitalize on fatigue with Cuomo's leadership and corruption in Albany, the state capital. One of Cuomo's former top aides was found guilty on corruption charges in March, while a number of other onetime Albany heavyweights have faced similar charges. Still, it was not immediately clear that Cuomo, who was sitting on a $30 million campaign war chest at the beginning of the year, would have a serious primary challenge. Several big Democratic names passed on mounting a primary challenge to the governor before Nixon stepped in. Nixon, a staunch ally of New York City Mayor Bill de Blasio, a Cuomo rival, launched her campaign in March pegged to fixing the dilapidated New York City subway system. Since then, she has tacked far to the left, endorsing ideas such as legalizing recreational marijuana and abolishing U.S. Immigration and Customs Enforcement. If elected, Nixon would be the first woman elected Governor of New York, as well as the state's first LGBT governor. Yet despite enthusiasm for Nixon in some quarters and on social media, Cuomo has held substantial leads against Nixon in the polls. A Siena College poll released last week showed Cuomo with a 41-point lead over Nixon, 63 percent to 22 percent. A Quinnipiac University poll similarly found Cuomo with a 36-point lead. But Nixon has attempted to capitalize in recent weeks from a series of gaffes from the Cuomo campaign, such as when the governor said "America was never that great" during an August rally and then quickly backtracked. Infrastructure issues also continue to invite bad press for Cuomo. The long-awaited Mario M. Cuomo Bridge, a vital means of transportation across the Hudson River, was closed due to safety concerns one day after Cuomo cut the ribbon for it in September. The New York Times then reported that the Cuomo camp offered sweeteners to contractors to get the bridge open on time. Cuomo and the state Democratic Party also got into hot water after the party sent a false mailer suggesting that Nixon was anti-Semitic. Party Chair Geoff Berman said that the mailer was a "mistake," but did not say who was responsible for the flier or whether that person was being fired. A spokesperson for Cuomo declined to say whether anyone signed off on the mailer before it was sent. "This was not a mistake, this is not like a typo," Nixon said in response on "The Brian Lehrer Show" on Tuesday. "A lot of people were involved in concocting this and executing it and approving it. And we need better answers." The scandal deepened when a Cuomo campaign official emailed a New York Post reporter saying they had proof Nixon supported the "Boycott, Divestment, Sanctions" movement against Israel. "Can get you folks on the record slamming her as well," the official wrote in the email. The official then sent text messages to the reporter later that week, saying, "hey I got something for you on [N]ixon….I'm going to email to you. But not from me." Cuomo's ticket is also in danger of being thwarted by insurgent candidates. His running mate, Lt. Gov. Kathy Hochul, is facing a serious primary challenge from progressive New York City Councilman Jumaane Williams. His preferred pick for attorney general, New York City Public Advocate Letitia James, is mired in a four-way primary. Attorney general candidate Zephyr Teachout, who launched an unsuccessful primary bid against Cuomo in 2014, has been endorsed by Sen. Bernie Sanders, who has also endorsed Williams. Teachout is running on a platform of tackling corruption in Albany. The other candidates are Rep. Sean Patrick Maloney and former Cuomo official Leecia Eve. The Cuomo name is a New York institution. Mario Cuomo served three terms before losing to Republican George Pataki while seeking his fourth. But Cuomo's name could also be a curse for voters looking to inject new blood into Albany. None of the Republican candidates for statewide office are facing primary challenges. Polls open at 6 a.m. in New York City and surrounding counties, and open at 12 p.m. in 49 upstate counties. Polls close at 9 p.m.